At GasMasksAndFilters.com you have several different payment methods to choose from. 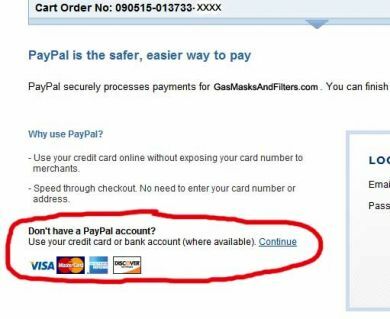 PAYPAL - If you have a Paypal account, you may send your payment securely via this method. Select 'PayPal and Credit Card Payments' as your payment method. ONLINE CREDIT CARD PAYMENT - If you wish to pay online by credit card, during the checkout process select 'PayPal and Credit Card Payments' as your payment method. You do NOT have to sign up for, or have, an existing Paypal account to use this payment method. When the Paypal page opens, look about mid-way down on the left side of the page. CREDIT CARD BY FAX OR MAIL - If you wish to pay by credit card, you may alternatively print and fax your order and credit card authorization. Select 'Postal or Fax Order Form' as your payment method. Your order and authorization will print, and the fax number and mailing address is also displayed. CHECK BY MAIL - You may send a check for payment, however your shipment will be delayed to allow extra time for your check to clear. Select 'Postal or Fax Order Form' as your payment method. Your order form will print, and the mailing address will be displayed. Please note the "make checks payable to" information, and make your check out accordingly.